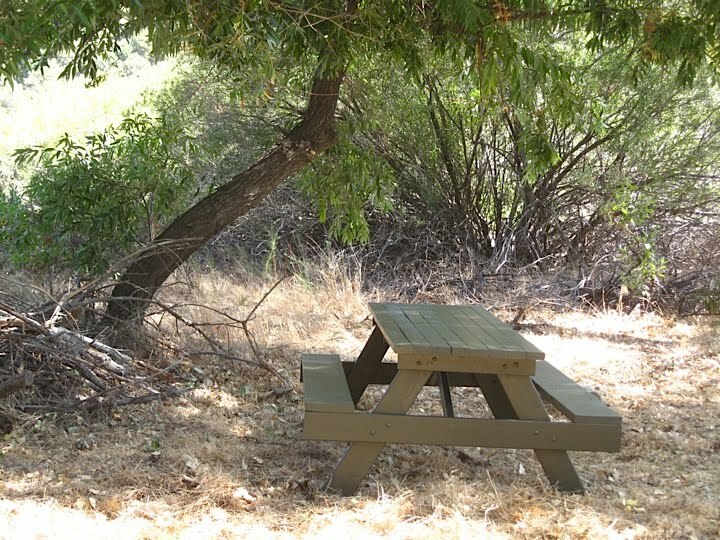 On October 29, we'll be out for a day of brush clearing and tread repair in Spunky Canyon. Students of the Wildland Fire Academy at Antelope Valley College will join us, but we could still use your help! Contact me to sign up. 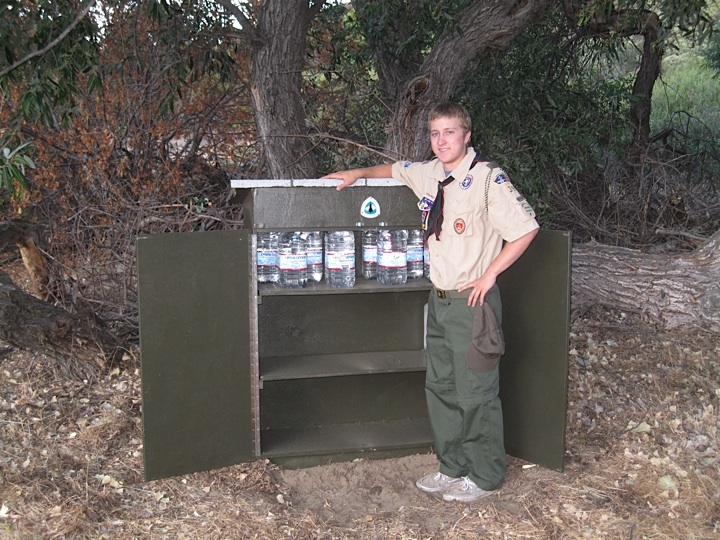 Eagle Scout Candidate Nik Petrik, from BSA Troop 39 in Lancaster, recently performed his Eagle service project on the PCT in Section E.
The spot under the trees in Lake Hughes Canyon has for years been a popular thruhiker rest spot, owing to its rare shade and water cache. 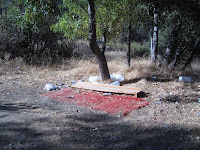 But it had gotten rather trashy lately, partly because of the many busted-up water jugs that local volunteers have refilled for years (photo at left). Nik volunteered to lead the project to clear the area of debris and trash, but he also built this outstanding picnic table and water cabinet, matched them with an unobtrusive shade of green paint, and with help from family and members of Troop 39, brought them out and placed them under the trees. According to the trail register at Green Valley, one of the, if not the first, thruhiker to make use of the table, was Scott Williamson on his southbound attempt to break the PCT thruhike speed record. 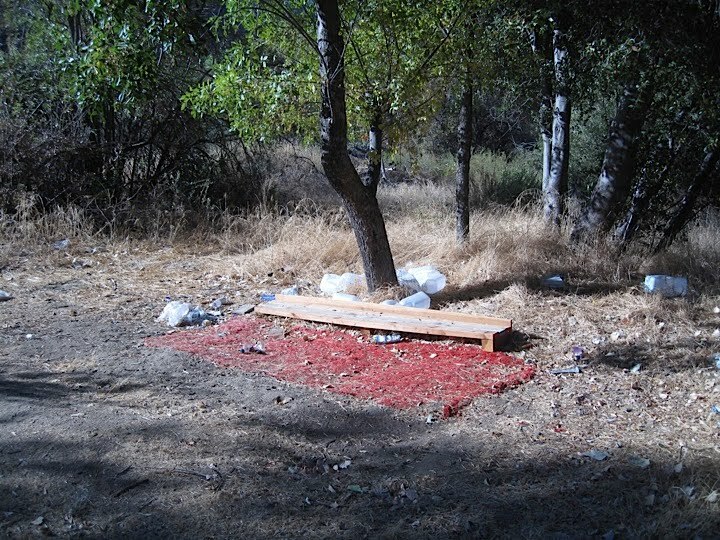 Big thanks to Nik, his family, friends, and Troop 39 for doing such a great job at making this stopping point more welcoming and usable for the trail users.